Remember me? 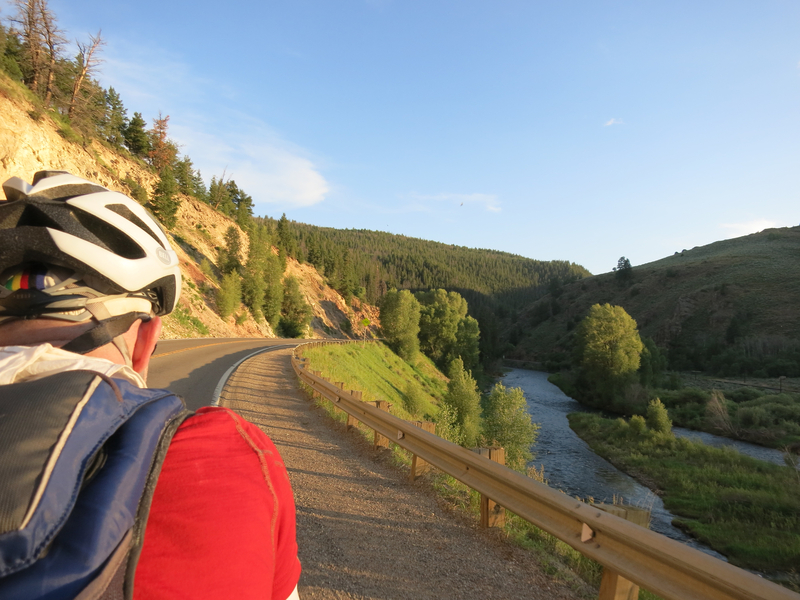 It’s been a few days, but I’m mostly free of my post bike tour fog and thought I’d rip off a quick top 10 list of what I learned on our tour. 1. Time changes when: a. you are on vacation, and b. riding your bicycle in the Colorado mountains. Vacation removed my get-there-itis and that was a good thing because if it had not, the climbs would have pedaled it out of me. 10-mile climbs. 15-mile climbs. Some even longer. Riding over these passes requires a different mentality than climbs out east. 2. It takes Felkerino and me 11 pedal strokes to ride 1/100 of a mile when we ascend between five and six miles per hour. I learned this as we rode up Wolf Creek Pass. 3. Do something that intimidates you, but doesn’t scare you (too much). The last day of our tour, Felkerino and I had to choose between the shorter harder route over Rollins Pass and the longer paved route over Berthoud Pass. We chose Rollins and I’m so glad. 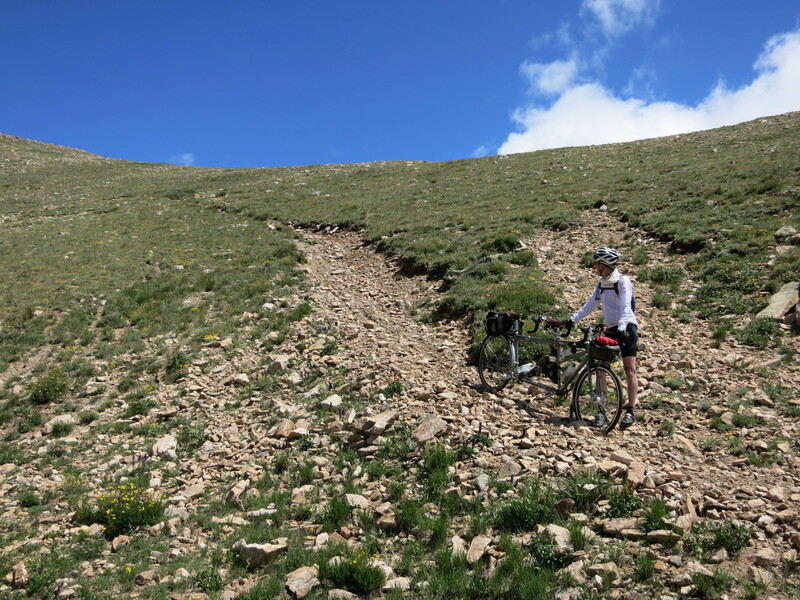 We were able to use all we had learned riding off-road and put our teamwork skills to the task to climb over Rollins Pass. Like I wrote before, it was a fantastic experience. Byers Canyon. Do not stop here or the mosquitoes will eat you. 4. Properly adjust your helmet so that you are not memorialized forever with crooked helmet syndrome in your vacation photos. This also ruins your self-image of bada$$ bike rider who has topped a mighty pass. Crooked helmet photo on Trail Ridge Road. 5. Stop for espresso. You might get lucky. Many Colorado towns have coffee shops. Some pulled what we started calling a “country shot,” which was essentially a small Americano, and some used old beans. 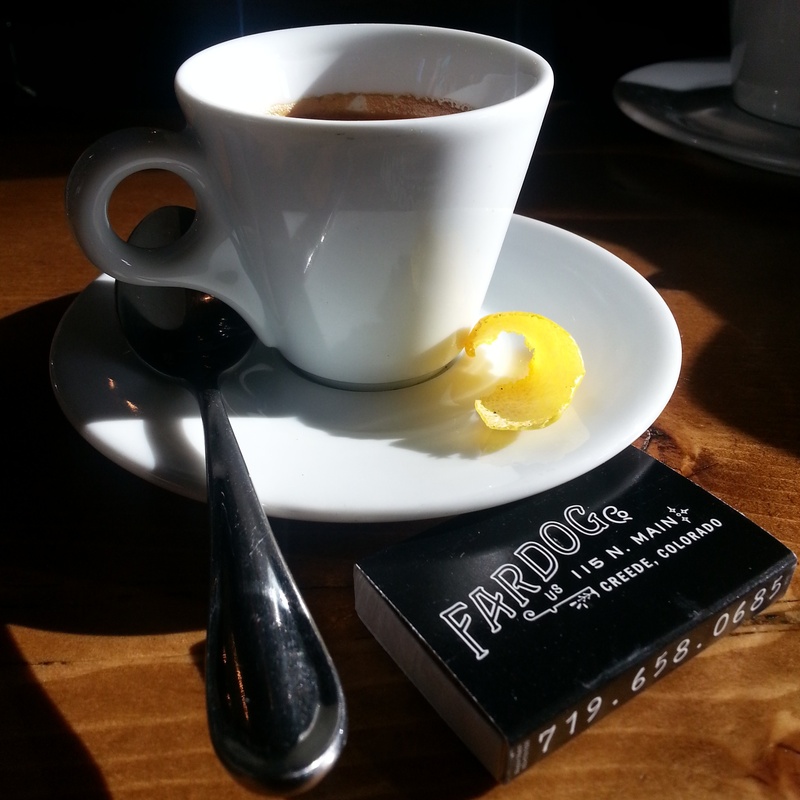 Others, like Fardog in Creede and City on a Hill in Leadville, took their espresso seriously and the coffee they served made it hard to leave town. 6. 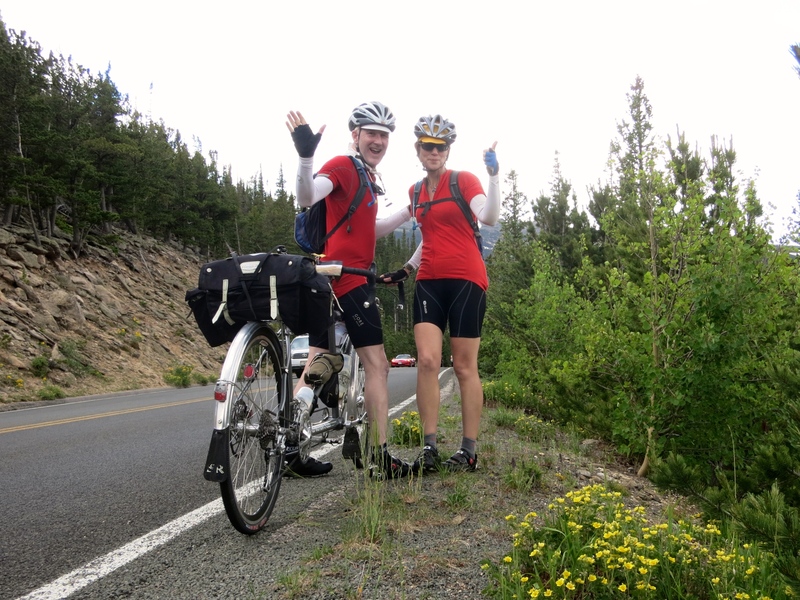 Flies and mosquitoes love bike tourists, especially when you have paused or are on an uphill. I thought the mosquitoes were bad in Iowa, but they have nothing on their Colorado brethren. And the flies! Big and biting. If you look closely at the photo below, you can see the flies swirling around us– the worst photobombers. As a subpart to this, do not stop for a nature break at dusk in a grassy area near a river. The mosquitoes will love you for it, but you will regret it! En route to Winter Park. There are flies everywhere in this photo. 7. It pays to travel light, in so many ways. Felkerino and I took one jersey, a pair of sunsleeves, and two pairs of cycling shorts each. We both had one pair of shorts and a shirt for evenings and non-cycling days. We carried our rainjackets and helmet covers, as well as our tools, tubes, patch kit, a spare tire, and a couple of wrenches. Toiletries were minimal, but did the job. I indulged and brought knee warmers, which I used a couple of mornings and during a rainy descent. Keeping our gear light meant we had less to carry over the big passes, and this really helped us out for our hike over Rollins Pass. 8. One bike is just as nice as two, most days. 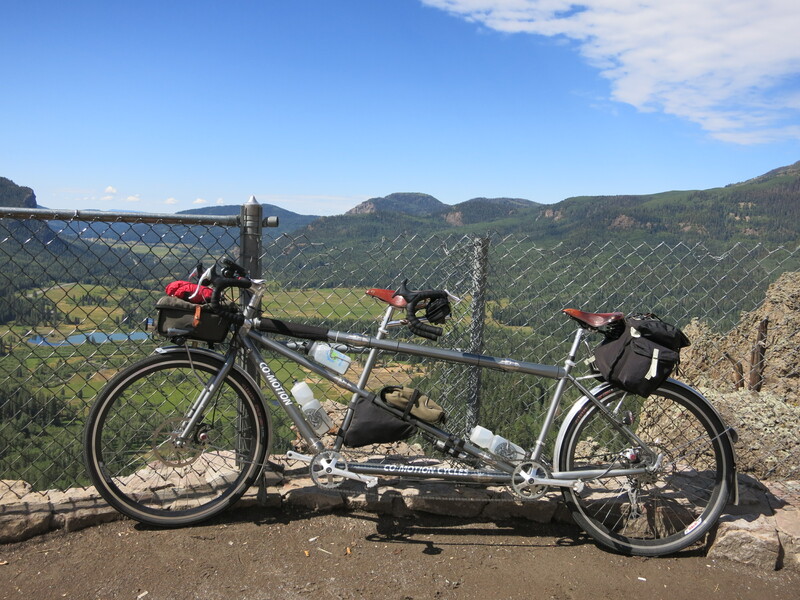 When tandem touring with another person, you travel intimately and you are a perpetually interconnected team. People are fascinated by tandems so it makes a good conversation starter. You only have one bike to worry about and you can share every pedal stroke of the journey together. Tandeming is wonderful in many ways and I would not want to tour with Felkerino any differently, but as a person who also likes riding alone it can make you a little lonely for the single bikes you left at home. Just a little. 9. Trust that things will work out. 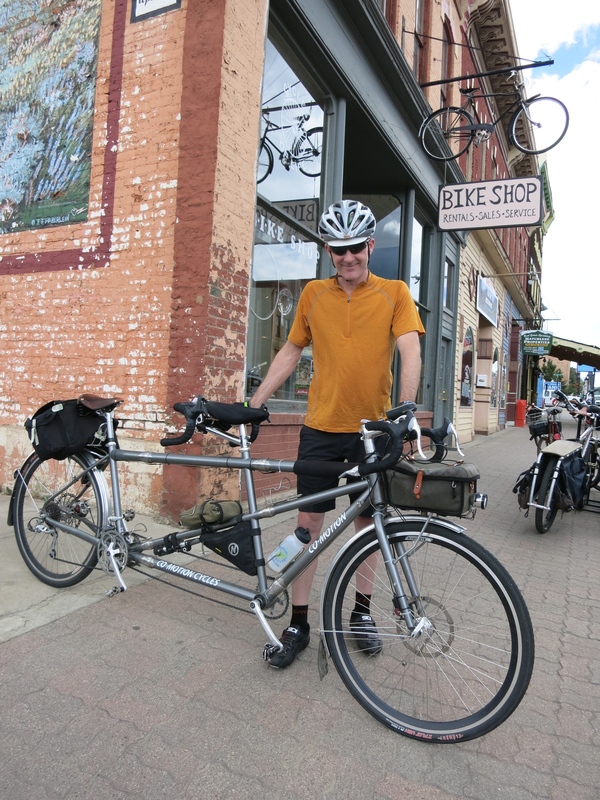 When we arrived in Leadville with a broken crankarm, I was consumed with worry, even though the circumstances of our mechanical could not have been much better. However, when the bike shop did not immediately have the part we needed, my anxiety rose. Fortunately, Community Threads had the right crankarm in his random bike parts box to keep us going. Wow. 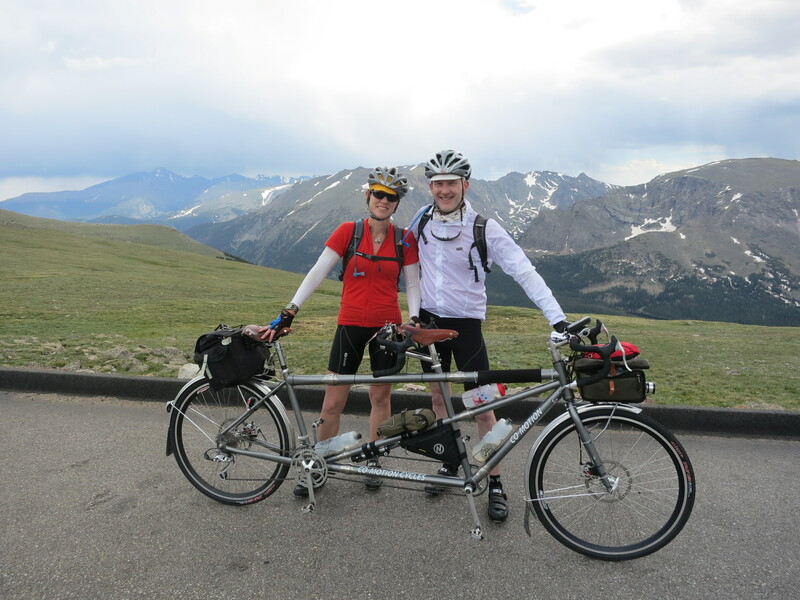 Cycles of Life and Felkerino with our backwards crankarm tandem. 10. Good friends help great tours happen. A million thanks to Tim and Donna in Colorado. They let us stay with them as we readied for our days on the road, welcomed us when we returned, prepared delicious meals during our time with them, and indulged our pre-tour nerves and post-tour stories. Thank you. What a fun post! I would LOVE to do this. I will absolutely concur with #6. A few summers ago, we took a bike/camping trip through the Midwest. When we stopped in Iowa the first night at a KOA, I immediately went into the convenience store to find mosquito repellent (as I’d failed to pack some). As I was buying the spray, I chatted with the woman behind the counter who told me that even though we were near a lake, they really didn’t have a mosquito problem. As someone who gets “ate alive” by mosquitoes, I wasn’t wanting to take the risk, but I didn’t put any on and survived the time we were there without a single bite. Now, here in Colorado, that is a completely different story. I walk out our back door to turn the sprinklers on and find myself with half a dozen mosquito bites (I wish I were exaggerating). So, absolutely, without a doubt for anyone else who is mosquito-candy, I highly recommend some sort of spray while here between mid-June and mid-September. Nice blog.. We are from Co but live in Singapore. I miss the cool, dry air and great riding… At least for now. As I got to the end of the article I saw the mention of Tim ad Donna. I doubt I need to even check with them to see if it is the same Tim I have ridden with for 20 years. He is a great rider and a great person to chat with on a ride. Donna is a great cook. It’s great that you enjoyed the mountains this summer. Thanks for sharing.